Sit and relax with a nice cup of tea in the beautiful garden and enjoy the care-taking staff. We are happy to arrange all kinds of tickets, flights, trekking etc. 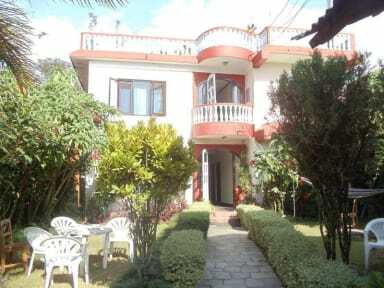 for you, so you just need to lay back and enjoy the breathtaking atmosphere of Pokhara area. Stunned by impressive mountain views in the morning, gentle lake-sunsets and entertaining nightlife of lake side. Have had an amazing stay here. Actually we have now stayed twice as it was so good. Staff are so friendly (especially the host) and will help you with whatever you need. They ask you if there are any activities you want to do but don't try and push a sale it's totally done out of friendliness. Have had an ace time here and would stay again. 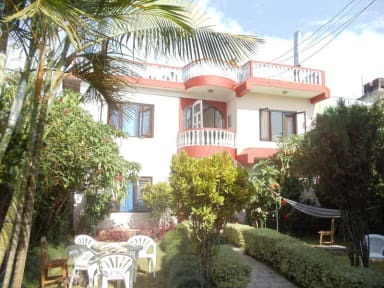 We really enjoyed our stay at Nepali Cottage Guesthouse, although if you are looking to meet other travellers your best bet is to try one of the hostels even though there is a graden for meeting up. The owner is so lovely and accomodating to any request you could possibly throw at him. The wifi is great, and the showers are the hottest I have experienced on my travels so far. They securely stored our bags for us without charge when we went trekking too. Location is also perfect! Everything was pretty great about staying here. The location was super central and we walked to the lake and around town. The room was perfect (had a few ants crawling) but other than that I absolutely loved my stay here!!!! I would totally recommend this to anyone looking for an easy and affordable spot in Pohkara. I loved my stay in Pokhara. This is the perfect budget location- rooms are basic, but totally adequate. It is on a quiet street off of the main strip so it is easy to walk anywhere. The staff were extremely friendly and helpful in terms of recommending things to do, and how to get around. They helped me book Paragliding (7000 rupees) and a trip to Sarangkot to watch the sunrise (1500rupees) for a reasonable prices. I enjoyed the juice bar down the street for musli and fruit in the morning! This is great accomodation for travellers on a budget. The room is very spacious and comfortable. Bathroom facilities are good, shower is always hot. Wifi is good. Rooms are equipped with a fan too! Very helpful with accomodating your needs! Great place with large beds and clean bathroom as well as hammocks outside! The owner is very friendly and helpful and the juice andsandwich places down the road are great! Very happy stay here although not a place for socialising!